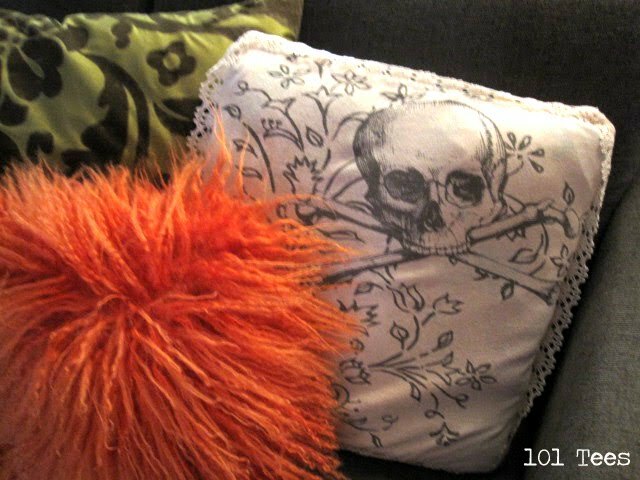 Cathie Filian: 101 Tees: Skull and Crossbones Pillow recrafted from an old Tee! 101 Tees: Skull and Crossbones Pillow recrafted from an old Tee! This seasonal slip cover can be whipped up in under 1-hour! Perfect for adding a little haunted decoration to your living room for Halloween or any day. Begin with an old Halloween or skull themed T-shirt. Choose a pillow to make a slipcover for. Remember you can remove the cover after Halloween. Make sure the pillow measures smaller than your tee. Cut up the side seams of the tee. Place the front and back on top of each other. Use a fabric marking pen and a ruler to mark a square shape. Make sure the square is slightly larger than your pillow. Cut out the square shapes. Pin lace trim around the outer edge. You can use flat or ruffled trim. Pin the front and back together with right sides facing right sides. Stitch around the edge. Remember to leave an opening for turning and stuffing. Clip the corners to remove excess bulk. Turn right side out and stuff the pillow inside. Hand sew the opening closed and place on your sofa. I am so excited to get a peek at your new book Yee Hah, LOL. So cute! I am gonna make something similar, thanks for the inspiration! How do you make the orange pillow featured in this picture?